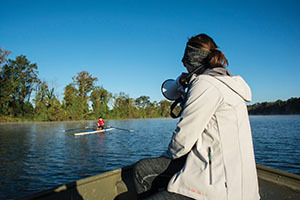 There is a bustling undercurrent of activity around the I-20 bridge in Columbia, blending nature with tourism and sports through rowing's rich traditions. Driving back and forth along a familiar stretch of highway there is that one tranquil spot - maybe a park, a pasture or a river - that calls our name. It's that roadside escape that lures us to strike out on a hike, climb into a deer stand or commandeer a canoe. A prime example of "roadside Zen" can be found on the ephemeral stretch of I-20 in Columbia that spans the beautiful Broad River. During a ten-second drive over this bridge, you may catch a glimpse of a gawking great blue heron floating along the shoreline as an unassuming angler makes his cast. You might spot a shimmering rock bed draped in lilies or sunning sliding turtles lined up for a nap. And if your drive-by timing is really good, you'll get to see the Columbia Rowing Club stealthily skimming through the river corridor, working with every fluid stroke to inch ahead of one another. Take a moment to envision yourself quietly gliding down the river in one of those sleek rowing shells, traveling alongside wading birds, hawks, turtles, otters and countless other river critters. Whether you consider yourself an outdoor enthusiast, recreational paddler or just a "bucket list" kind of person, heading out on a rowing excursion, or even joining a rowing team, can become a reality. 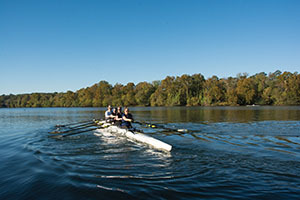 The Columbia Rowing Club (CRC) has developed a hub for this sport right in the heart of the city - near the Broad River Road exit - and is drawing in high school, collegiate and masters rowers (above age 21), as well as a new wave of river enthusiasts. If a tranquil excursion in a rowing shell seems like something you might like to try, the fundamentals can be practiced at home. Mark Conrardy, CRC president, offers a simplified lesson in rowing by placing a pencil on the floor a few inches away from his feet. From an upright position he leans down with knees slightly bent, picks up the pencil with two hands, stands up and lifts it straight up to his lower rib cage. This is the full range of motion you would use to pull an oar through the water. Conrardy, who got his start rowing while a student at Kansas State University, meets up with fellow CRC members and guests to row year-round and sometimes several times a week. 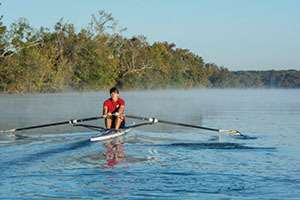 "The sport of rowing is a cardio workout, a weight-lifting workout and a mini-vacation all at the same time," he says. "It's also a de-stresser, focusing on rowing and the beautiful scenery on the river." Founded in 1998 by masters rowers who wanted to establish the sport and its tradition in the Midlands, the club has taken off by leaps and bounds, hosting annual regattas and rowing events that attract high schools, colleges and clubs from across the Eastern seaboard. 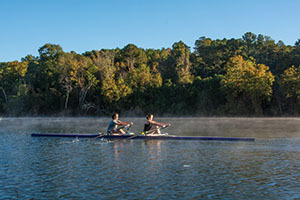 Throughout the club's many growing phases, CRC has received steadfast support from the industry and rowing teams near and far, as they recognize the potential that the Broad River has to offer. The characteristics of the Broad River have drawn paddlers and anglers to these waters for decades. It turns out that the current is also ideal for rowing. Conrardy says that during the club's infancy, John Worrell and Jonathan Fletcher were the first of their group to test rowing on a stretch of the river that the club would eventually call home. "The Broad River at I-20 has, most of the time, a very slow current to no current," he explains. 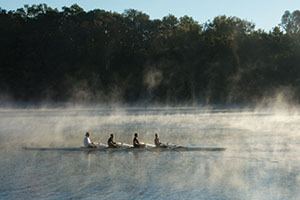 "It's perfect for the sport of rowing and offers some of the best rowing conditions in the United States." With generous support from the rowing community, the CRC was able to secure its current location and steadily build onto their fleet of rowing shells and equipment. And the seemingly endless generosity of other rowing teams would continue to grow. Conrardy explains that following the October 2015 flood, rowing teams from Augusta, the University of Rhode Island and others offered support, equipment and manpower to keep the club afloat. "The Augusta Rowing Club let us park our trailer full of boats next to the Augusta boathouse so that the Columbia Rowing Club could continue training throughout the winter. Bob Gilette, the head coach of the University of Rhode Island, even volunteered to come down to Columbia and help build a dock. One member, Laura Kissel, set up a Go Fund Me page that collected more than $20,000 after losing our dock in the flood. The biggest gift of all was from the EZ-Dock company who donated a whole new low profile rowing dock." This brand new dock was installed in February by EZ-Dock and is already in full use by the CRC's teams, events and learn-to-row groups. Laura Kline, CRC vice president and membership coordinator, got her start in rowing at a young age. "I was a swimmer, and some of the guys on my team had gotten into rowing. I took a learn-to-row class one summer and have been rowing ever since. My high school in New York had a big team, so did several other schools up there." Kline recalls many wonderful memories with her rowing teams over the years, including spring break training at Camp Bob Cooper in Summerton and racing at Head of the Charles Regatta in Boston. "I continued my rowing career during my time at Clemson University, and I'm excited to be a masters rower here with the Columbia Rowing Club." Kline is now leading adult learn-to-row groups on the Broad River, introducing first-time rowers to the sport, while training and prepping the club's masters teams for competition. "I've been with CRC for a couple of years now - I've coordinated the masters team events and the line ups for 5K distance and 1K sprints. Last fall, the first race we did was Clemson Sprints. We had several races that day, and we came home with medals." 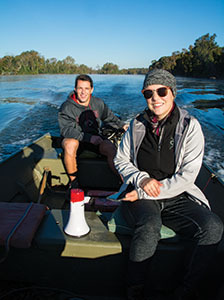 The CRC's Brielle Stark heads up the youth and masters rowing for the club, introducing many local college and high school students to rowing, along with novice participants of all ages. "If you're brand new to the sport, simply get in contact with your local rowing club and they'll teach you everything you need to know," she suggests. "Most clubs will run a ‘learn-to-row' orientation for new rowers. If you're transferring over, get in contact with the club to let them know your interest, and they'll invite you to meet and train with the squad." A soccer player until the age of seventeen, Stark transitioned into rowing during her college years, learning the fundamentals on the Schuylkill River in Philadelphia in 2008 under Olympian coaches Carol Bower (USA) and Gabrielle Cippollone (East Germany). The energy, enthusiasm and experience that Stark has to offer CRC rowing teams is immeasurable. While studying abroad at the University of Oxford, she earned a spot as coxswain, charged with steering the boat for the men's team at St. Anne's College, and while working on her Ph.D. at Cambridge University she coxed for the Cambridge University Women's Boat Club's lightweight squad. Recently, Stark was Captain of Boats at Caius Boat Club (at Cambridge College). Together, Conrardy, Kline, Stark and their rowing colleagues are developing a strong regional and international network that is drawing more and more teams to row on South Carolina's idyllic rivers. 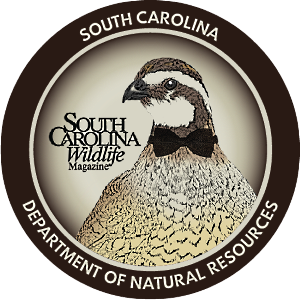 It's undeniable to those who visit that the Palmetto State boasts some of the most treasured natural areas in the country and the world. "We've seen deer swim out in front of our boats, lots of fish, with a few jumping fish flying over the boat!" Stark says. "And lots of bird activity. I've rowed on a lot of incredible rivers so it's hard to pick which one is the best. I really like rivers with nice, straight banks (like the Broad River), but that's because I'm a cox, and straight banks are great reference for steering straight. It's also nice to row in sunshine almost all the time here in South Carolina! Having spent five years of rowing in England, where the predominant weather pattern is gray sky and cloudy, it's a welcome change." Whether you like to fish, paddle, surf or row, there is little dispute that our backyard waterways and river corridors are a living extension of who we are. This rings true for Stark. "Coxing has taught me a lot of skills, many of which have transferred off the water and into my personal and professional life. I've had the privilege to cox in several different countries, and I always appreciate how rowing can be done on such a variety of bodies of water - ocean, river, lake or tidal river." 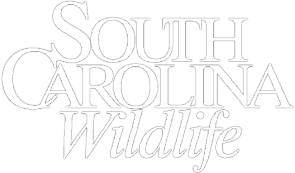 The SCDNR and S.C. Association of Tourism Regions encourage you to see for yourself all that our scenic waterways have to offer. 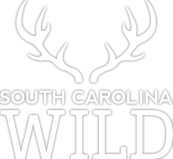 Visit www.dnr.sc.gov, www.scatr.com or www.columbiarowingclub.com to plan your adventure.